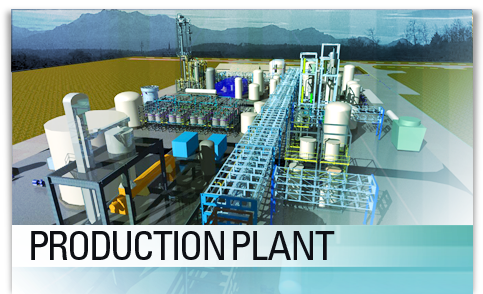 To the left is a 3D rendering of a BlueFire ethanol production plant. Izumi is a small industrial town of 50,000 with an agricultural component, on the southern tip of Japan, several hours travel SW of Tokyo where warm, hard-working people are found. The facility is sited next to a 35-year old NEDO ethanol purification facility. Having started up in September 2002, the facility is under contract to NEDO through 2007 to produce sugar for ethanol production. JGC will use this plant as the platform from which to scale the technology to various capacities, marketing to its client companies in Japan and SE Asia.